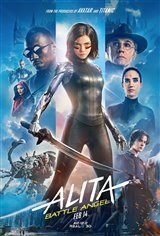 In the post-apocalyptic town of Iron City, Dr. Dyson Ido (Christoph Waltz) discovers an abandoned cyborg core named Alita (Rosa Salazar) and rebuilds her into a new body. There she befriends the young Hugo (Keean Johnson), who dreams of escaping the city to live in Zalem, the city above Iron City. Based on Yukito Kishiro's 1990 manga series Battle Angel Alita.